Some things are unquestionably being lost in the shuffle of our abundantly multi-tasking, media filled, often self-determined 'busy lives'. I'll concede that real world factors play into this. In the midst of the current global recession, the cost of living continues to skyrocket in the cities of the western world and many who live in it's communities are working longer hours than ever. These factors are also impacting the career minded, who in hoping to fall on the opposing side of growing wealth stratification, are finding their lives dedicated to paying the astronomical debt accrued from the cost of higher education. But as do less concrete 'lifestyle choices'; no small percentage of the population are, as media theorist and educator Neil Postman posited in 1985, in effect, "Amusing Ourselves to Death" with disproportionate quantities of technological distraction. Add to this the cyclical perpetuum mobile of experience validation and self representation that is social media, and it's maybe more accurate to say that the 21st Century is not only shaping up to be defined by escapism, but a narcissistic overdrive. One that cultural theorist Lance Strate titled his 2014 collection of writings on Web 2.0, "Amazing Ourselves to Death" as a companion to Postman’s original. In this psychological landscape, inner reflection, self-observation and sorting the events, intellectual and emotional values of the day are becoming things which one has to willfully and concertedly make context and opportunity for. Allowing for time to engage in activities as simple as finding oneself in the park sitting on the green, lingering outside a cafe with one's mobile device set aside, or the pastime of a protracted physically and cerebrally engaging walk. Recent research published in Stanford's Journal of Experimental Psychology has supported that even extended walking in a largely sensory-devoid sterile gym on a treadmill improves creative thinking. Consider then then what navigating the open, often expansive and abstract scapes of the natural world does for the mind and creative self? Centuries of writing and personal research found in the journals and correspondence of some of the western world's most notable literary figures give credit to it's benefits. You'll not find a better overview of those writings than Finlo Rohrer's "The Slow Death of Purposeless Walking" published last year in the pages of the BBC. Citing the thought processes and regular ritualized walking by such figures as Henry David Thoreau, Virginia Woolf, Charles Dickens, and William Wordsworth and how time for walking was inexorably bound to not only their creative lives, but their sense of self, place and a way being in the world. A tradition not only of their era, but one some of the literary greats of our past century avidly and enthusiastically engaged in. George Orwell, Thomas De Quincey, Friedrich Nietzsche, Vladimir Nabokov, are among it's greatest proponents, even supplying in the most literal sense the substance of their work. By example, what would WG Sebald's influential body of work be without his regular ambulations through the louring austerity of Suffolk? Not limited to journeying into the abstraction of the natural world, there's engagement to be found navigating the geometric parceling of the city's grid as well. And when your forays take you to the less rigorously defined urban spaces of the cities of Southeast Asia or the dream-labyrinth of Europe's almost Borgesian puzzles like that of Venice, no amount of GPS connectivity is going to be an aid. Much like the nature walk, it's best to put the map aside. Through these indirect navigations, urban trekking can be seen as not just as a vehicle for self-awareness and creative sustenance, but as one of active, participatory engagement with the contemporary landscapes in which many of us live. On city trekking Geoff Nicholson, author of "The Lost Art of Walking"; "I do most of my walking in the city - where things are spread out, there is a lot to look at. It's urban exploration. I'm always looking at strange alleyways and little corners." Nicholson lives in Los Angeles, a city that is notoriously and by intent in it's design, car-focused. "A lot of places, if you walk you feel you are doing something self-consciously. Walking becomes a radical act," says Merlin Coverley, author of "The Art of Wandering: The Writer as Walker". For the urban walk as political act, one need look no further than Will Self's 2012 inaugural lecture as Professor of Contemporary Thought at Brunel University and his literally titled "Walking is Political", reprinted in the pages of The Guardian. The particulars of how one goes about navigating that space can itself be considered political. In the era of the smartphone map-dependent, it's not uncommon for people to only take occasional glances away from an electronic routefinder to avoid stepping in an open manhole or being hit by a car. "You see people who don't get from point A to point B without looking at their phones," Rebecca Solnit, author of "Wanderlust: A History of Walking". "Members of an urban community used to get to know the lay of the land, to be part of the landscape through memory and observation", says Nicholson. "I do think there is something about walking mindfully. To actually be there and be in the moment and concentrate on what you are doing." Looking at the larger continuance of walking as urban psychological, social, communal (and even political) act it's important to consider that a century ago, 90% of westerners' journeys under six miles were made on foot. Through it's incremental disappearance as a regular aspect of people's lives, we are becoming increasingly alienated from the physical reality of the landscapes in which we live our lives. Originally published in a different form as part of "Expanses: Forays into the Geography of the Unknown" for the Substrata 1.4 catalog. 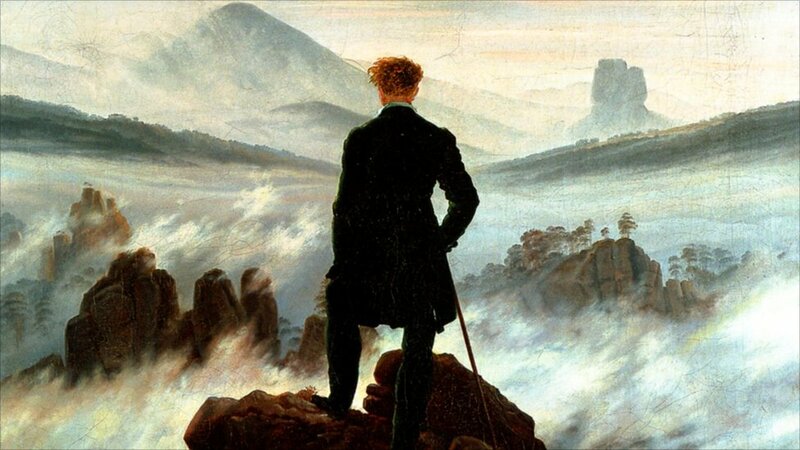 Painting credit: Caspar David Friedrich.